I’m afraid there won’t be many updates in my blogs for the next week or so, while I am coming to terms with the sudden loss of one of my much loved cats. Chester, who was five, died after a very short and sudden illness. 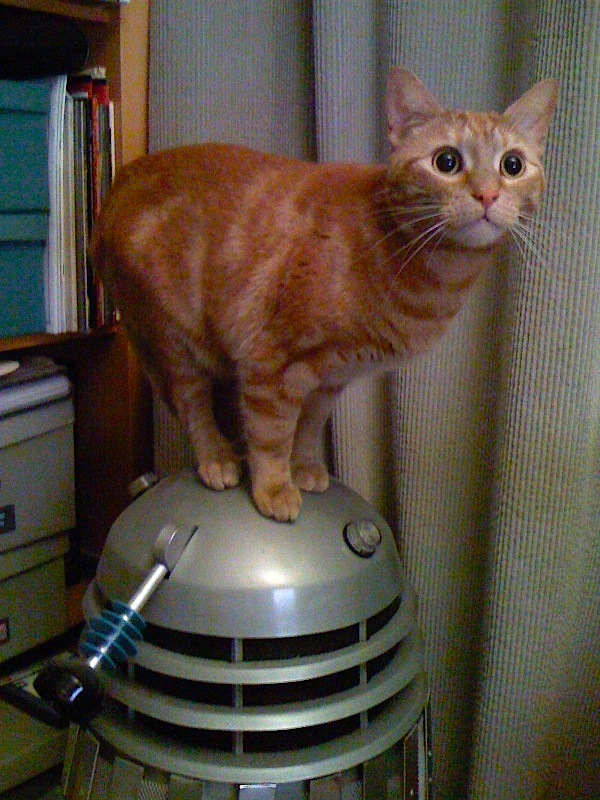 Despite being rushed to the Royal Vetenary College in South Mimms – the UKs leading animal emergency care hospital – they were unable to save him and his vital functions slowly slipped away, taking from us a much loved and cherished member of our household. I will respond to emails as best I can and will get back to work very shortly. In the meantime, please spare a thought or two for Chester. It has been a very tough week. I keep expecting Chester to come around the corner while I am trying to work, pestering me yet again for a bowl of food or at the very least a tickle. You don’t quite realise how their obsessive routines so deeply interweave with your own and become part of how your day regularly unfolds. We have been very touched and deeply moved by the number of comments posted below, as well as personal messages I have received. I have read every single one many times over, and knowing there is sympathy and support from friends and clients as well as casual readers has been most uplifting at this difficult time. Thank you all so very much, and if you wish to add to the comments I warmly welcome them. Greatcoat - where did THAT come from? So, the first episode of Season Six part two has been shown, and we’ve now finally seen the new Green Greatcoat in action. With it being mainly set in pre-War Germany, I think we were all expecting (certainly I was) that given its military style and appearance, the coat would be picked up somewhere along the line as part of the plot. 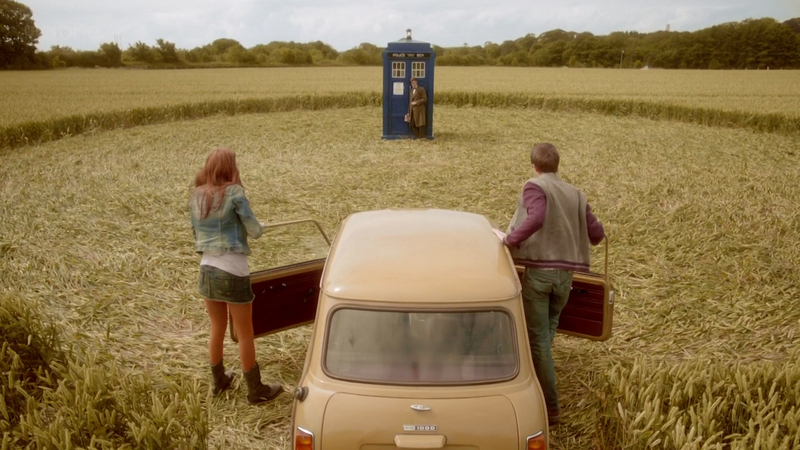 But no – Matt popped up wearing it from his very first shot! No explanation. So what was all that about? Ganger boots - positive identification! 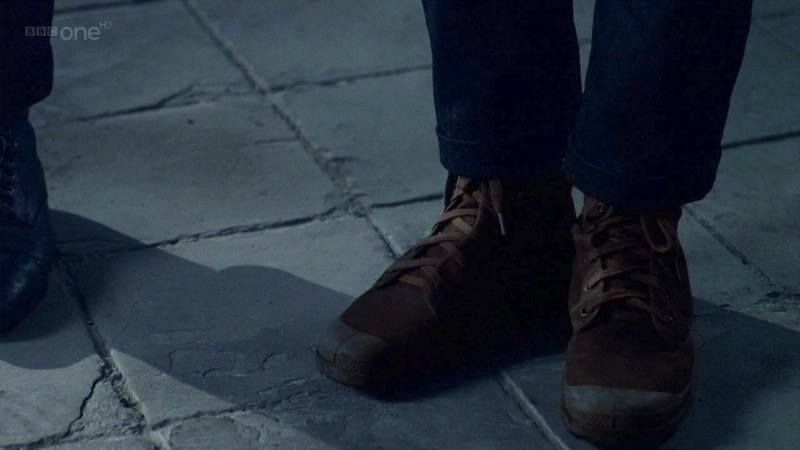 A lot has been said and written about tracking down THE boots Matt Smith has been wearing in season six, without officially finding the answer, as yet. But on a brighter note, the alternative footwear he sported in The Rebel Flesh and The Almost People has been found by an eagle-eyed member of the dw_cosplay forum. Here is another screengrab, lighten to show the detail. Apparently they are by a company called Palladium, who also made the footwear Amy Pond wears in A Good Man Goes To War. 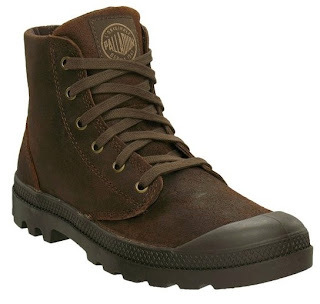 The boot style is called Pampa Hi Suede, and you should look for them in the chocolate colourway. 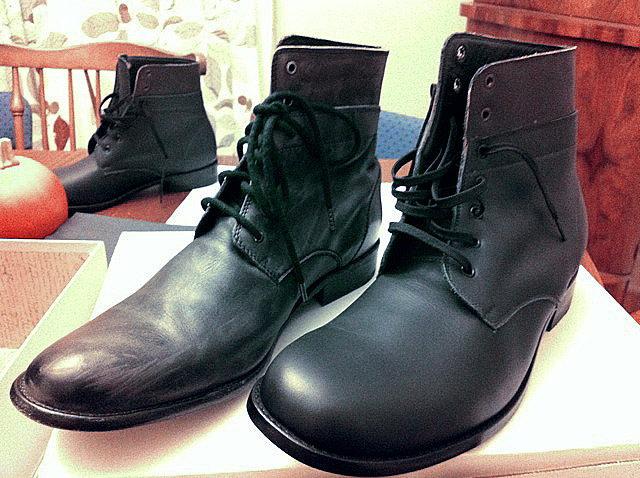 They are (at time of writing) STILL current, and can be ordered through their online store. 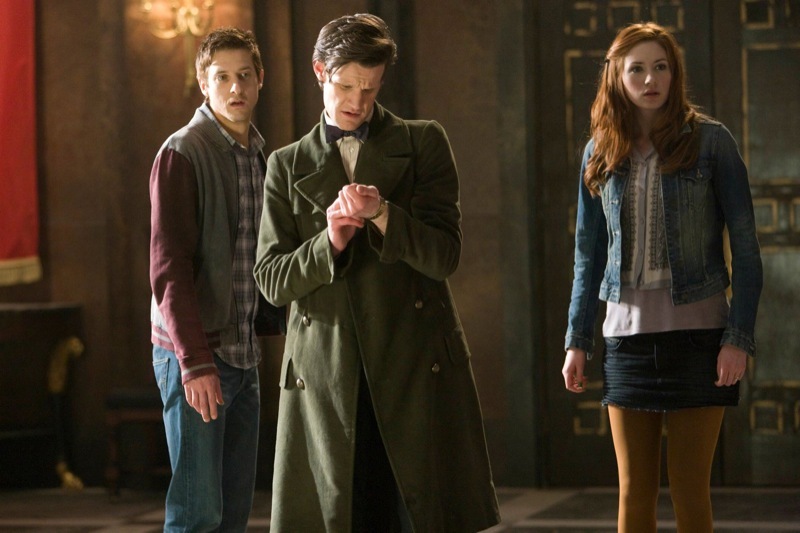 It’s less 48 hours now until the second half of Season Six kicks off, and we will finally get to see a much anticipated addition to The Doctor’s wardrobe: the Green Greatcoat! 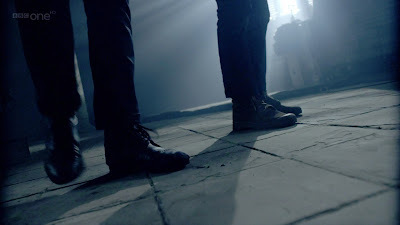 The very first hint and glimpse of it appeared in March this year, when Matt was spotted filming scenes for what we now know to be episode 12, Closing Time. 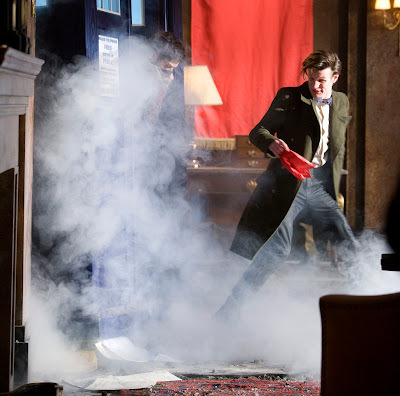 But what has tasken us by surprise from the episode previews of Let’s Kill Hitler, is that Matt will be wearing the new coat right from the outset (see below). 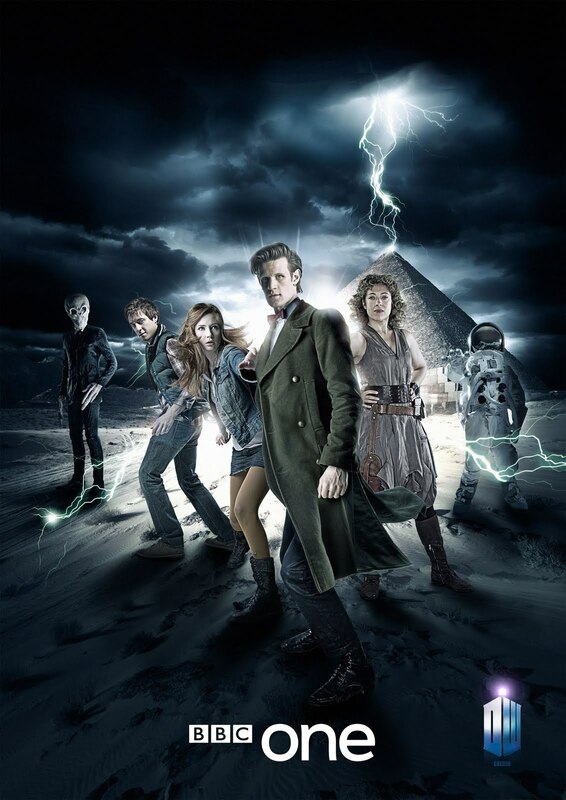 The BBC have also issued their promotional image to launch Season Six part two (see below) and the new coat is featured prominent there too. 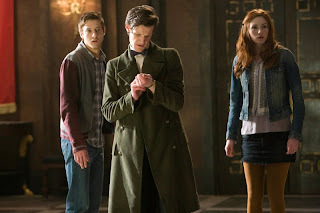 At last we are now get a proper look at the coat, and I must say I am liking it even more. 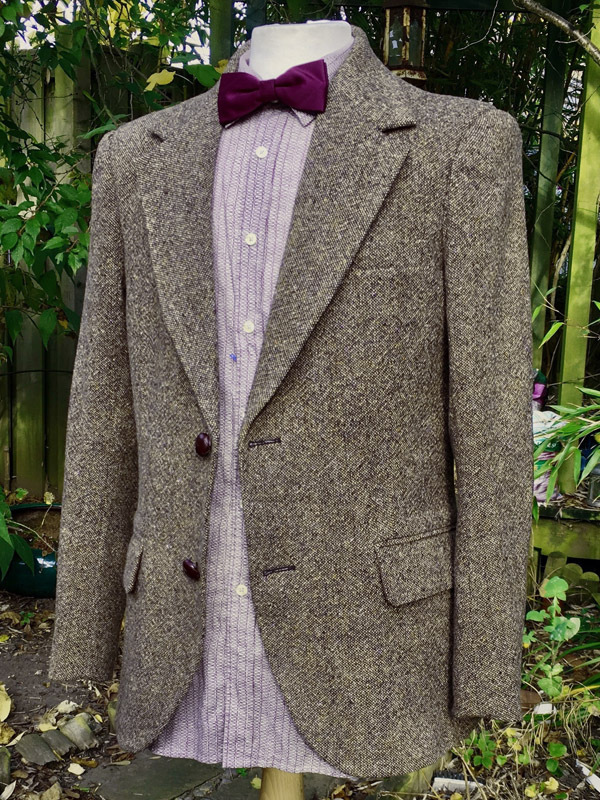 If you have been following what I have been up to recently, you will have seen the Prototype Shetland Tweed jacket I made, followed by a couple of proper jackets. Now I have nailed what I need to do, I thought I’d share a few bit of making them. So, next thing I need to sort out are the sleeves. To make sure I always cut the fabric in just the right place, I have marked the edges with a highlighting pen to show the positioning of the stripes. 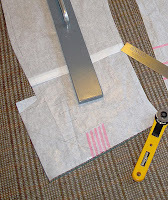 This is marked at the cuffs (see left) and at the sleeve-head (see above, left), where I also mark the horizontal stripes that need to align across to the body. Now I have cut the fabric, I need to prepare it before stitching. To keep the cuff edges crisp, I have interfaced a two-inch strip along the cuff fold (see left, top). I then chalk the stitch-line for the cuff mitre. The cuff is then folded diagonally from the corner point, and I stitch along the chalk-line. I then trim to a standard seam allowance, and press the cuff flat, giving me a nice simple single seam line from the corner of the cuff vent. 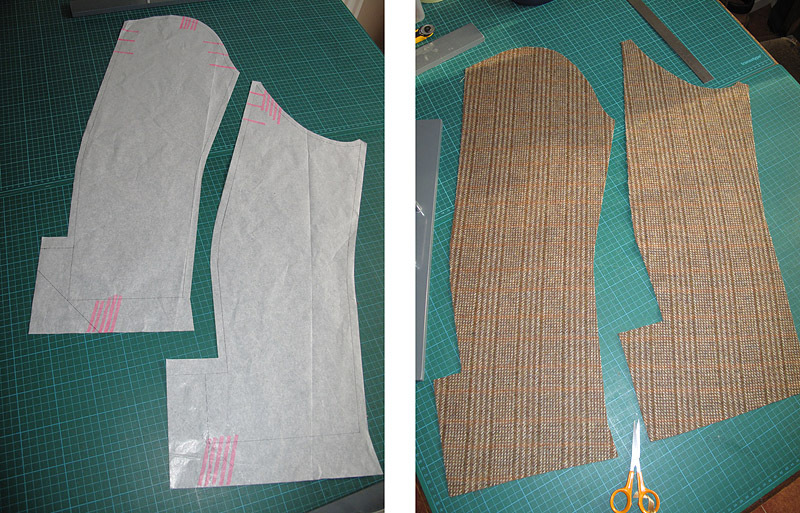 I then sew the two parts of the sleeve together along the back seam. While I have the sleeve in a flat form, I can easily set the three buttonholes for the cuff vent. 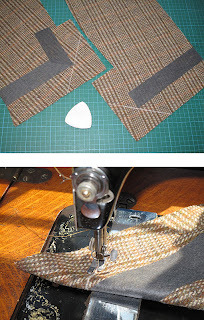 Again, to make things as easy for myself as possible, I am going to sew the elbow patches in place while the sleeve is still in a single flat form. 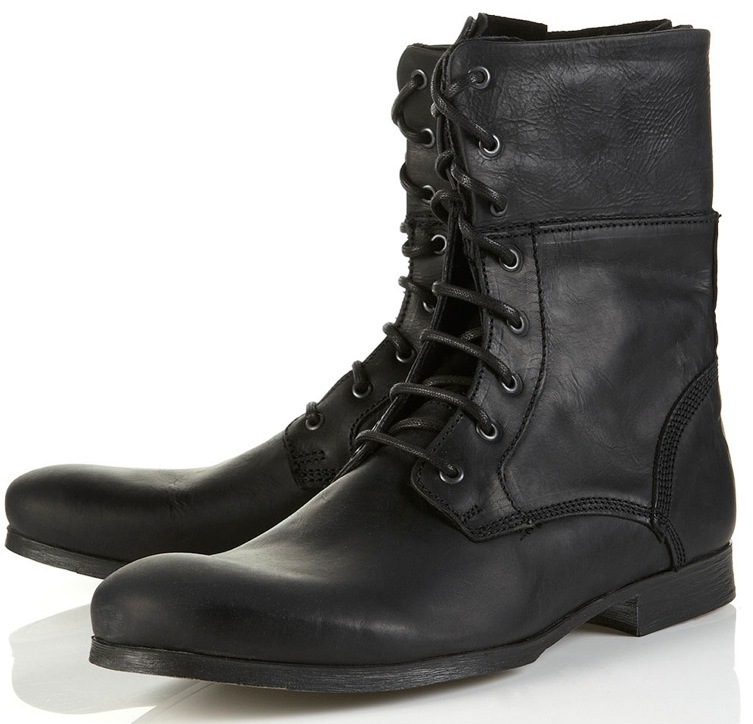 The patches are real leather and have pre-pierced sewing holes around the edges. 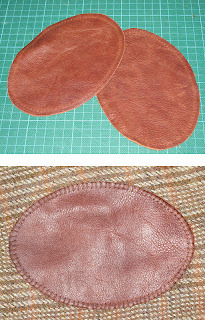 These have to be hand-sewn in place and I use a strong top-stitch thread, sewing in a blanket stitch around the patch. It is SO much easier working the patch while the sleeve is still flat. Once the patches are done I can finish the sleeves off by sewing the front seam. They are then ready for setting. 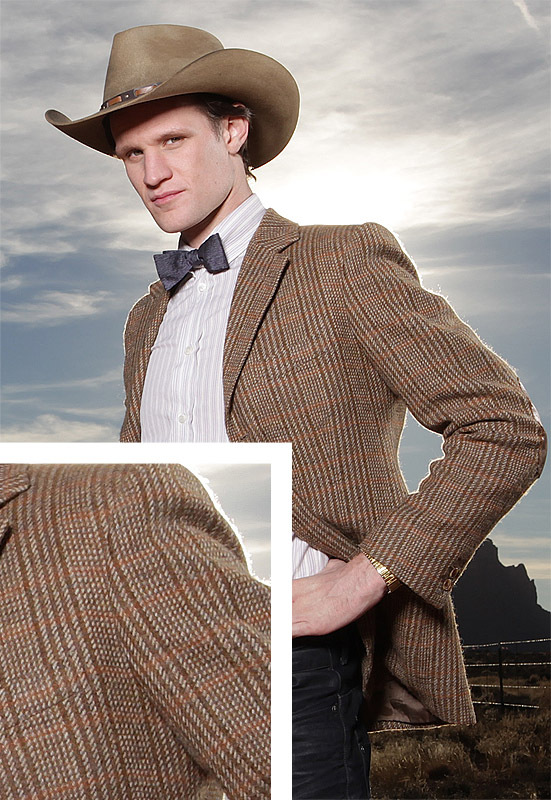 All have been made using the THE original Shetland Tweed from which Matt’s jackets were cut (see left). Well now I have nailed what I need to do, I thought I’d share a few bit of making them. First up I need to cut and make the body of the jacket. 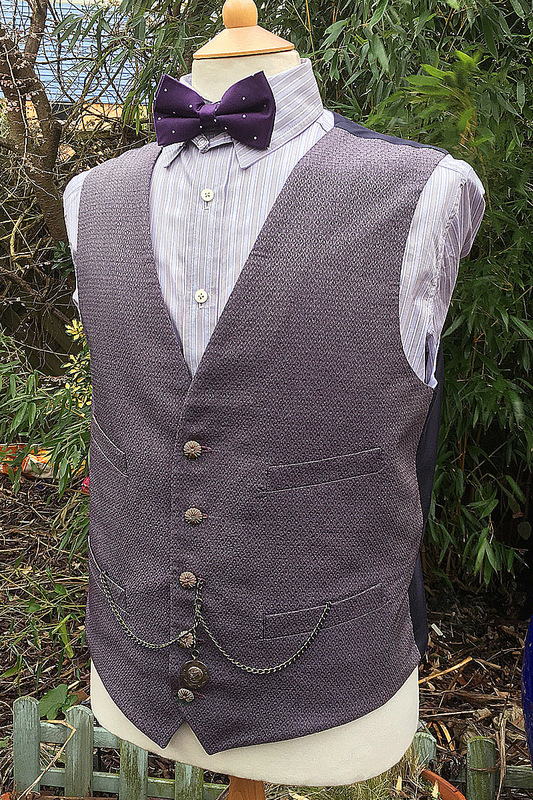 The pattern was based closely on my basic Edwardian Lounge Jacket, which I original cut to make my Tennant Suit. 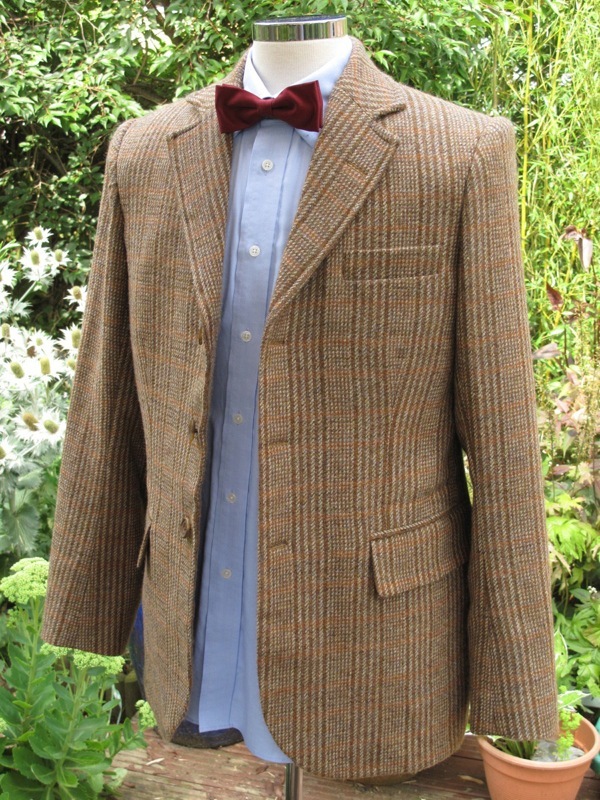 I have had to distinctly up my game for this jacket. There is no room for error or allowance for adjustment later, so I have to be a lot more disciplined when making it. Why you ask? Well, the fabric has a pattern to it, sure, but it has an annoying irregular pattern repeat. There is a horizontal orange stripe which is spaced 35mm apart, then 40mm apart, then 35mm apart again. 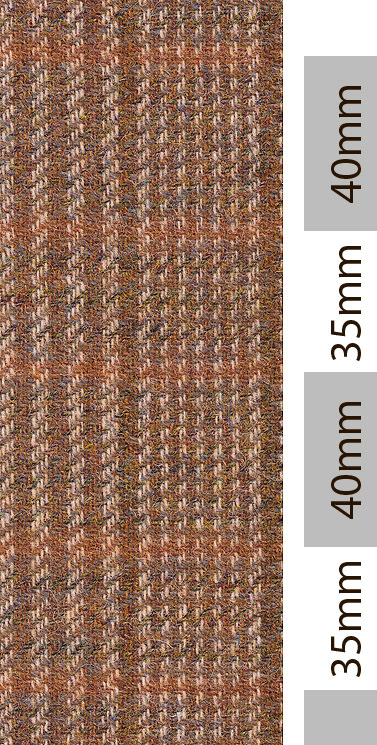 This makes the true vertical pattern repeat some 75mm. As an FYI, form what I have seen the Abby Shot rewoven fabric has missed this subtly completely, and has made the spacing equal between all their orange stripes. Okay, so we got that. But there is a further complication: the horizontal stripe needs to match across from the body to the sleeve-head. This means I have to cut the fabric to within a few millimetres tolerance, limiting me to where I can position them on the fabric. With the second half of series series six about to start, the BBC have released a number of publicity stills, including this high resolution costume portrait. 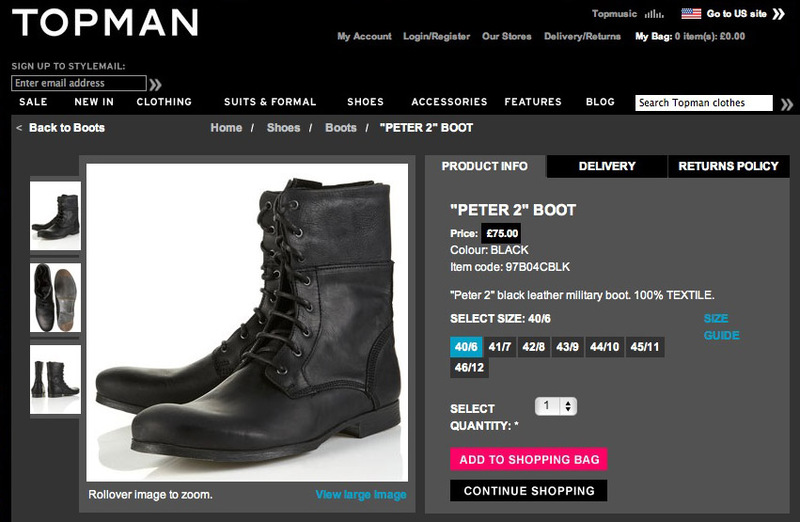 A friend sent me a link today to a pair of new boots being made by TopMan. 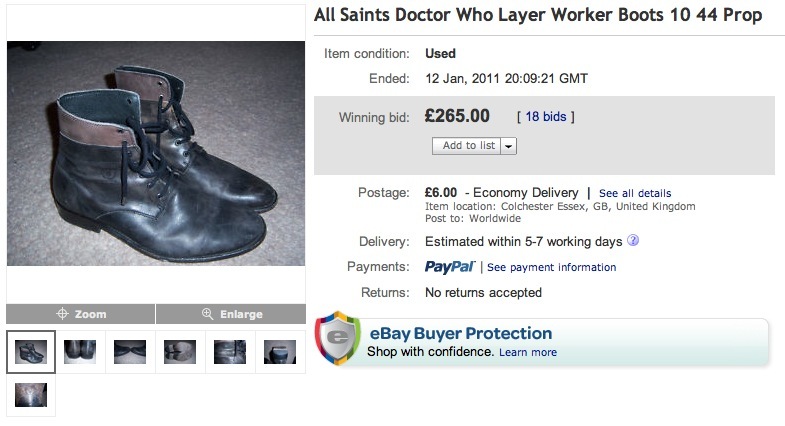 They are a curious hybrid of the All Saints layer Boots from series five and the new black boots from series six! They are curiously tilted the “Peter 2” Boot. Phew – I’ve had a busy week – not helped by being laid up for part of it with a stomach upset. 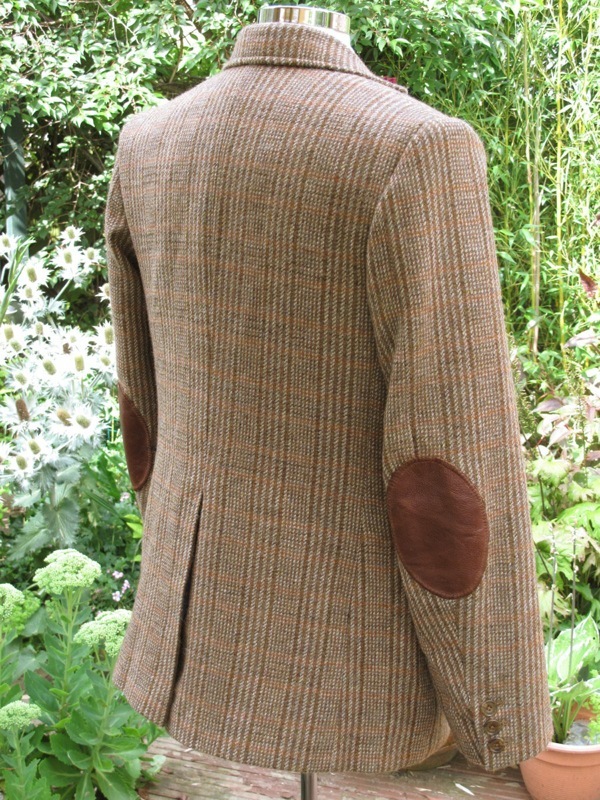 Anyway, needs must, and I ploughed on to complete two prize jackets back-to-back. First was a Shetland Tweed, with all the trimmings! 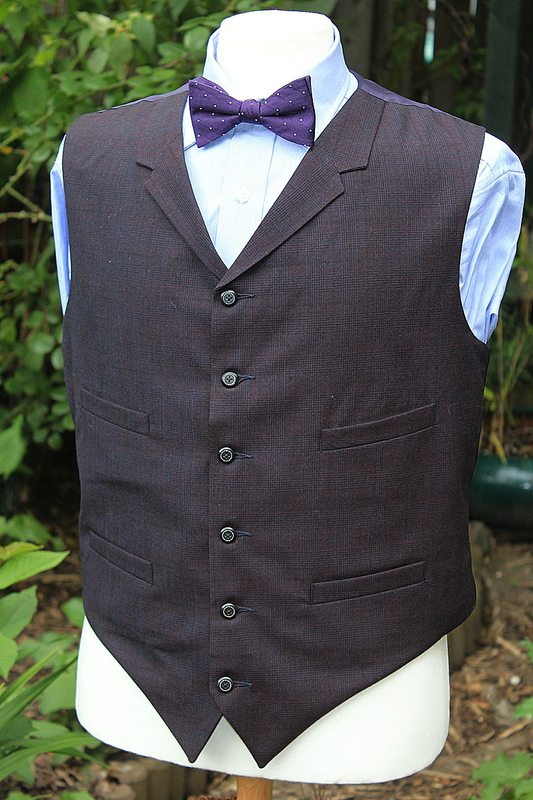 I think I really have the pattern nailed for the jacket, and have mastered the fabric pattern aligning. The elbow patches I have sourced are just right, and are made from a very natural leather. 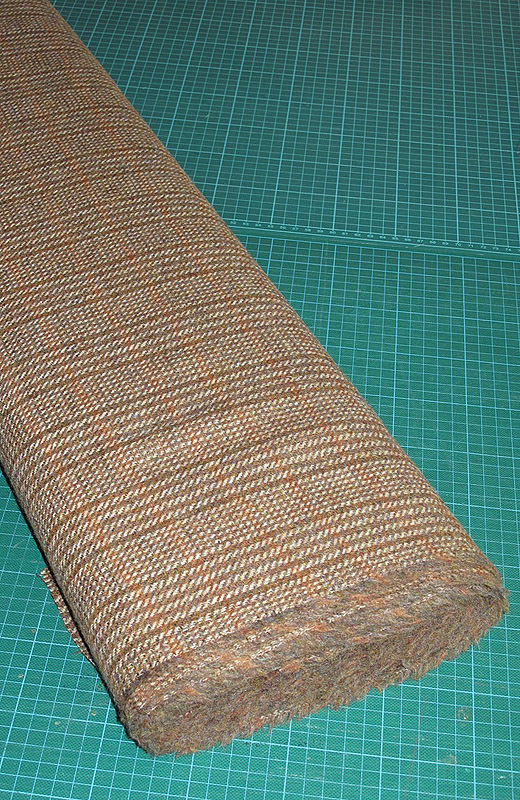 Some I had seen off the shelf at haberdashery stores have been very dull and in single colour. 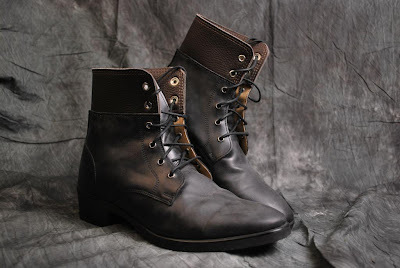 They didn’t have any character, but the ones I am using are hand cut and made to order, so are much more characterful. 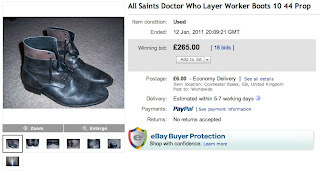 Yesterday I posted a entry about a client of mine who created their own All Saints Layer Boots (see left) by adapting an existing pair of boots bought cheap off eBay. Well today I have been contacted by a reader who has gone one step further, and commissioned his own replicas – built from scratch! Season Five’s elusive All Saints Layer Boots still tease and frustrate all of us - especially those who missed out on the chance of getting a pair when they were current. Okay, so these aren’t perfect – but I bet they had you fooled and still have you staring at them trying to work them out in your mind!